Find your next project in our extensive range of blackwork kits with large discounts and free shipping to your door. Blackwork is an ancient form of needlecraft and has been popular since Tudor times. 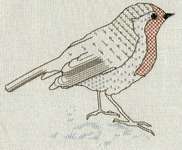 Blackwork is a counted thread technique and is usually worked using a chart on Aida or Evenweave fabric with a blunt needle - similar to counted cross stitch or needlepoint. Blackwork kits have all you need - fabric, pattern, thread/floss and a needle and beads or other embellishments. 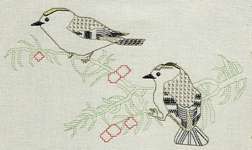 Typically, a blackwork design is completed by backstitching the outline and then filling in the internal areas with the blackwork pattern. The overall effect is a light and airy design with almost lace-like interest. And ... not all blackwork is black! 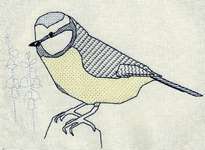 We sell only genuine and original blackwork kits direct from the makers. 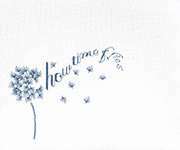 Rose Swalwell of Derwentwater Designs has produced several imaginative blackwork kits with mainly English country themes. Leon Conrad's blackwork kits are intricate symmetric patterns and some also have gold highlights.